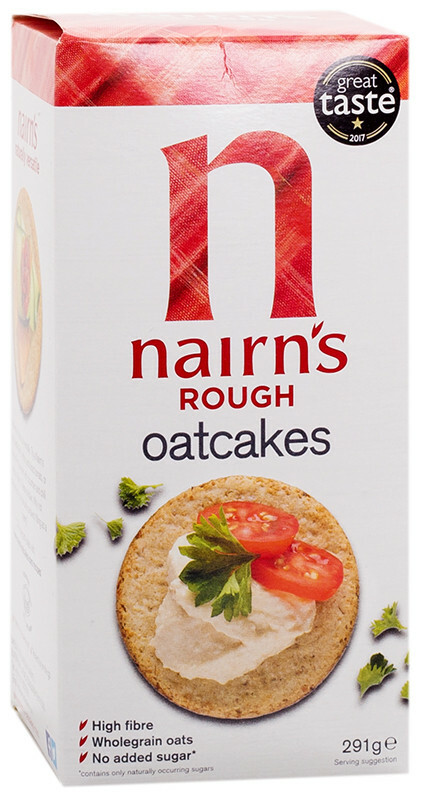 Baked according to a traditional Scottish recipe, Nairns Rough Oatcakes give you that great toasted oatmeal flavour, and a whole lot of nutritional benefits too. These oatcakes have a high rough wholegrain oatmeal content, making it a rich source of fibre with a low glycaemic index (GI). Nairns gives you a healthier way to snack at work or school, with nutritionally rich rough oatcakes packed in convenient pouches of six. The palm oil used to make Nairns oatcakes is sustainably sourced and approved by the Round Table for Sustainable Palm Oil (RSPO). Did You Know? Oats contain special antioxidants known as avenanthramides, which fight inflammation and promote healthier arteries. Not suitable for those allergic to the protein avenin.